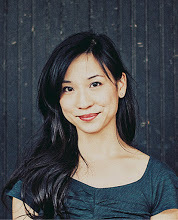 Lydia Kang is an author of YA fiction, poetry, and creative non-fiction. 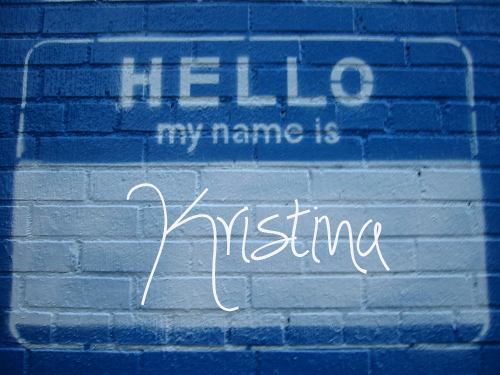 She is a part-time internist and has a blog where writers can learn the most accurate way to maim their characters. She believes in science and knocking on wood, is an unapologetic salt addict and thinks Star Wars should have been Ewokless. CONTROL, her YA sci-fi with romance and adventure, is coming December 2013 from Dial Books for Young Readers (Penguin). An un-putdownable thriller for fans of Uglies. Add it on Amazon and Goodreads and keep up with Lydia on her website! 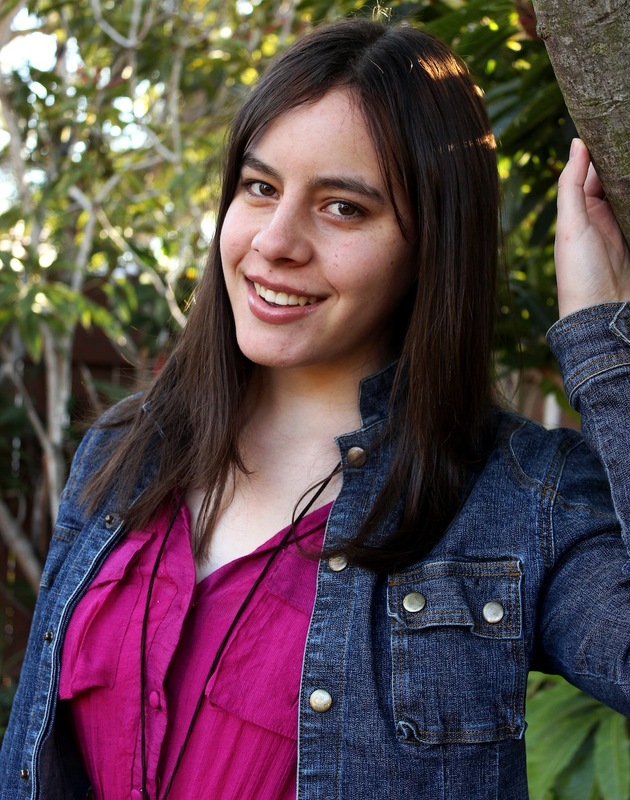 Let’s see how Lydia answers the Proust Questionnaire! Knowing my family and friends are happy. Also when I feel, in my bones, that the majority of humans on this crazy earth are more good than bad. Holy cheezits, the only thing going though my brain right now is Air Supply. Oh, the pressure! I have too many favorite songs, but I know my first favorite song as a kid (maybe preschool?) was Yesterday, by the Beatles. I thought it was deliciously depressing and dramatic. To be able to paint photorealistic portraits. Or do a back handspring. Either one. When I am trying to convince myself that one more Peppermint Patty is totally okay. Full of convolutions. Seriously, that’s what everyone’s brain looks like. Like mindedness. You can say things to them and they just get it without having to wave your arms around to illustrate your point. Anything by Rothko. 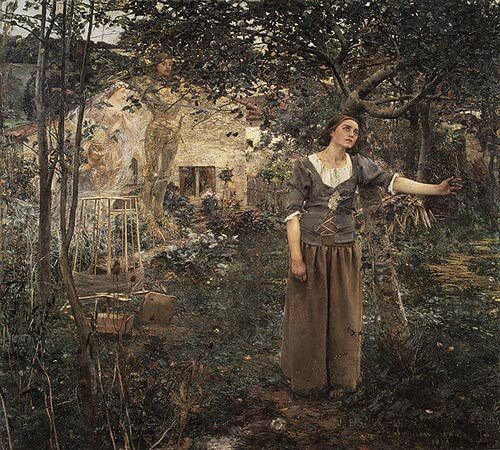 Jules Bastien-Lepage’s Joan of Arc. Becoming an author and becoming a mom. Creation is pretty fan-freaking-tastic. Did you mean a real one? Then I’d say my trip to Europe with my sister when we were in college. The morning, just after I’ve had my caffeine. Anne Elliot, from Persuasion. I’m pretty sure we’d be best buds. I’d want to know my family was happy. And have more than, say, 10 people read my book and say they liked it. I would say making stuff. I was always possessed with this need to create things. Combination safes out of paper; sundials out of toothpicks. And now, books. I went to a poet’s friend house, and his insistent Italian mom (he’s not Italian, I’ve no idea where that came from) made me pasta for lunch. The scent of a humid, spring day in Maryland. It’s my summer, it’s my childhood. It’s some terrible times when I was bullied, it’s the best forts I ever made in the woods. It’s the ruby red goblet I once found in a tangle of bushes. It’s picking raspberries off the bushes, it’s hunting for crayfish and looking for watercress and daffodils. Stephanie Diaz is 20. She will graduate from San Diego State University with a bachelor’s degree in film production this May. She’s a Whovian, Browncoat, and a publishing intern. Her work is represented by Alison Fargis of Stonesong. The first book in Stephanie’s debut YA sci-fi EXTRACTION trilogy is forthcoming from St. Martin’s, an imprint of Macmillan. Add it on Goodreads! Follow her on Twitter and her website. Wild berry tea, stars, an old leather-bound journal, and the smell of pine. I have a multitude of favorite songs, but the one that always sticks with me is To Build A Home by The Cinematic Orchestra. The piano, the build of the melody, the lyrics…it’s pure poetry. I believe I heard it for the first time sometime during high school. I wish I’d discovered it when I was much younger. I would love to be able to draw or paint. Lately I’ve been stressed because of school projects, but I finally have a free afternoon and I just finished reading a book, so at the moment I feel calm. 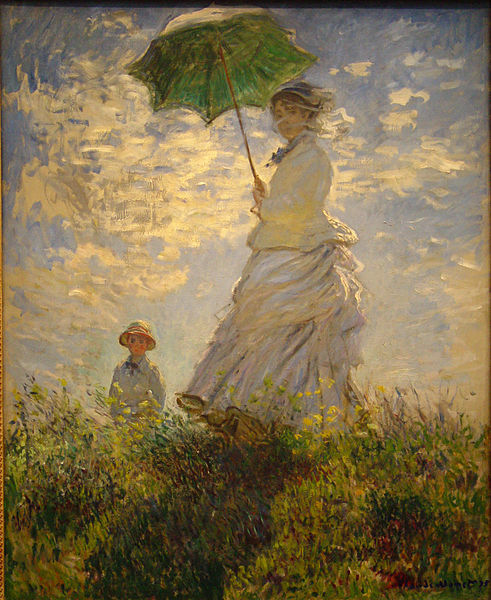 I don’t really have one favorite painting, but I am a fan of Monet. La Promenade in particular. Well, the journey of the Fellowship to Mount Doom fell into my head…so I’ll go with that! Around 2am, when most everyone in my house is sleeping, and there’s a beautiful sense of quiet, and the stars are out. It’s so hard to pick just one! But I’d love to share a cup of hot tea (I can’t stand coffee) with Gandalf. I have a long list of things I’d like to do, such as skydiving, visiting Europe, and traveling to space when public flights become availability (maybe that last one’s more of a fantasy––but it will happen!). But truly, I live for those moments of laughter and love with friends and family. And as I already have a multitude of those, I’m not sure what else I’d need. A couple nights ago, I dreamed I went to Knott’s Berry Farm (or, rather, a skewed version of said amusement park) with my sister and friends––but we went two hours before it closed, and I couldn’t understand why. We only got on one ride! It was thoroughly disappointing. Wild berry tea. When I was in second grade, my best friend and I were in a very small book club (we were the only members) with a teacher at my school. We’d meet in her classroom during lunch, and she’d make us tea (wild berry was always my favorite) and bring cookies. We’d discuss books to our heart’s content. Now every time I have wild berry tea, I’m transported right back to those book clubs, and to that time of outdoor adventures and fairytales when I was young. Michael Northrop is the author of three YA novels: Gentlemen (2009), an ALA/YALSA Best Book for Young Adults; Trapped (2011), an Indie Next List pick and an ALA/YALSA Readers’ Choice List selection; and his latest, Rotten (2013). 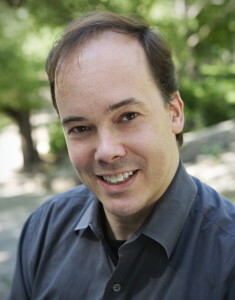 His middle-grade novel, Plunked, was named to the New York Public Library’s 100 Titles for Reading and Sharing in 2012. He is originally from Salisbury, Connecticut, and was a senior editor at Sports Illustrated Kids from 2000 to 2008. His articles and stories have been published widely. 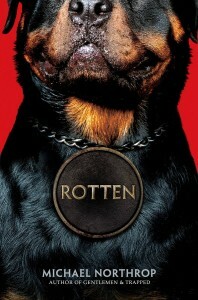 ROTTEN, published by Scholastic in April, is about a troubled teen named JD and a rescued Rottweiler named Johnny Rotten. Now let’s see how Michael answers the Proust Questionnaire! Happiness is hard for me to define because it touches on so many other things, and the borders are pretty porous. For example, I smile a lot. It’s kind of my default setting. But is that happiness? Optimism? Psychosis? There are moments when I think: Things are good, life is good, etc. But I suspect that might be more satisfaction than happiness. On the other hand, I share the general human tendencies to adjust to adjust to what I have, and to covet what I don’t. To me, happiness is something you search for, and hopefully catch sight of from time to time, like a Questing Beast. Foresight, or the ability to throw a really good knuckleball. I’ve had different favorites at different times in my life, so it’s hard to pick one all-time favorite, especially now that music is less central to my life than it was in, say, junior high. Then again, in junior high my favorite song was probably Take On Me, so perhaps it’s best to move on. I’ll say All Night Long by Peter Murphy, which no one’s heard of anyway. I first heard it in high school. The Smiths’ had just broken up, but my friends and I were still in a big-time mope rock phase. Murphy had been the lead singer of Bauhaus, which was before my time, but I had a bootleg cassette(!) of Bela Lugosi’s Dead that I treasured, so I was primed for All Night Long when it came out. 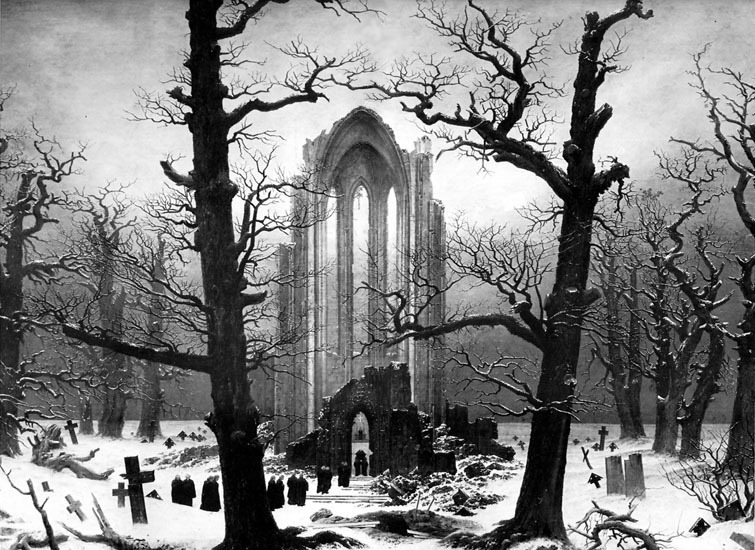 It’s a great song, too: a goth-flavored mix of pop music and art rock. Last night I dreamt that Cujo, the rabid St. Bernard from the Stephen King book/movie, was in jail. 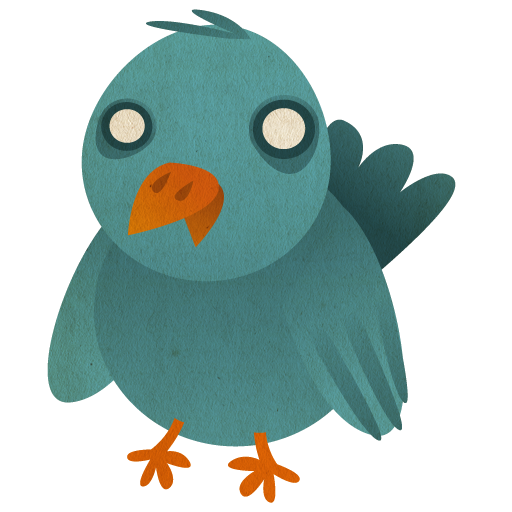 Convinced he was just misunderstood, I let him out. But nope, he was still rabid and proceeded to chase me around. I’d say my hometown. Not everyone loves theirs (au contraire), but I loved mine from the start. Even though I left there more than half my life ago, most of my books are still set in some fictionalized version of it. I would just need to die suddenly in the middle of a good day, possibly while writing. Bigwig from Watership Down. I think he’s one of the great, underrated heroes of literature. His society valued the exact sort of raw physical power that he exemplified, but he understood that those values were out of whack and gave it all up to help those weaker than him. Plus, it would be funny to see a rabbit drinking coffee. I’m a morning person. Not like 5 am, but more like 11. I’m a mid-morning person. It’s when I do my writing. I also like happy hour, but I feel like I’m just responding to a societal construct in that case. 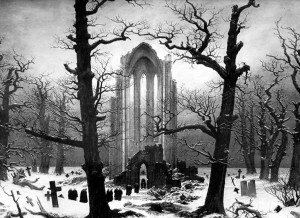 Cloister Graveyard in the Snow by Caspar David Friedrich, though I wouldn’t necessarily want it in my living room. What words or phrases do you most overuse? Just, kind of, sort of, in a way, maybe . . . I’m a qualifier. It’s very adolescent of me, but given my profession, I’m not overly incentivized to change. I value different things in different friends. I like to let people play to their strengths. I’m the same way with books. Never question the enterprise. It’s not an everyday motto, but I dust it off when the going gets rough. It’s not a Star Trek thing; it’s a reminder that it doesn’t help to get bogged down in the big existential questions: What is the meaning of life? What does it matter anyway? Why bother? I’m here now, and that’s that. Might as well make the best of it. There’s a certain kind of jelly doughnut (big, doughy, and caked with sugar) that reminds me very powerfully of childhood trips to Cape Cod.